Countless people visit Baltimore, either as an end point in their trip or in passing through. I am always amazed at how few people visit Fort McHenry during their time here. During the War of 1812, after the British had burned down Washington D.C., the troops and the British Navy next targeted Baltimore (a den of pirates and thieves from the British perspective), with the intent of setting the torch to the city. 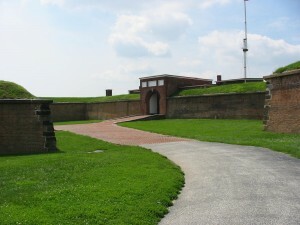 The main defensive fortification for the city was Fort McHenery, located on a jutting out section of land prominently in the Chesapeake just before the harbor town of Baltimore. After being caught without proper plans and defenses in Washington, the Baltimore citizens prepared to make a more significant stand against the British than had been made in the Nation’s Capital. A young lawyer was on a British truce ship negotiating the release of one of his clients (An American Doctor who had been imprisoned by the British because he threw poorly behaving British solders out of his house after treating many British wounded). While in the process of negotiating his client’s release, the British Navy began its move up the Chesapeake to lay waste to Baltimore. Francis Scott Key, the attorney watched the ensuing battle from the deck of the British truce ship from the beginning and through the night. When Armistead raised the giant flag over the garrison in the morning to clearly and proudly declare that they had withstood the British attack, Key was so moved that he sat down on the deck and wrote the poem The Defense of Fort McHenry.